I’m a sucker for tacky-sharp racing panning shots. 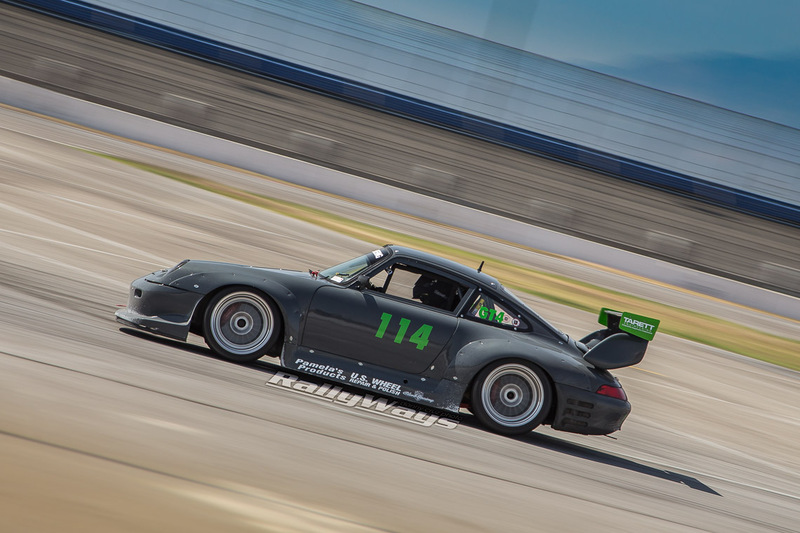 This photo of a racing Porsche 993 from California Speed Festival 2015 is a perfect example. The car is not particularly bright like some of the other more colorful examples at this year’s California Festival of Speed — I mean, it’s grey. Thanks to the speed, the motion and the surroundings, the car looks ever more interesting. Well, not to mention that it’s a pretty sweet racing Porsche 993 with wide fenders and a giant wing. I have a rather short lens. It’s a Canon EF24-105mm F/4L and I often have to make due with what I have until I go and splurge on a 200 or a 400mm. Thankfully, the media van guy (thanks John) drove me around the track at Autoclub Speedway and took me all the way down to turn 16. The bunker at turn 16 happened to be close enough to the track where my 105mm turned out to be perfectly effective. There’s a chicane right before the turn, though the slow down is rather minimal. Still, it makes it a much easier spot to shoot than panning at 175 MPH like you would at the end of the front straightaway near the stands. It was a really bright day and this photo was shot right around 2 PM or so – with the sun pretty much smack in the middle of the sky. I had my Canon 6D set to ISO 100 and the shutter at a moderately slow 1/80. All that yielded an aperture of f/7.1 — More than deep enough for a fast profile panning photo and a juicy fluid foreground and background. Needless to say, I love the shot. I didn’t do much to it either. I removed a little speck of dust that I have to clean off the camera soon. I also balanced the highlights and shadows to help with the brightness due to the harsh sun. Oh, and I also pushd the white balance a bit from 5650K to 5916K as I prefer slightly yellow shots as compared to Canon’s typical cooler blue photos. The photo was shot at an angle on purpose.